There are no strict requirements for an Offering Altar. What is important is the act and the participation, not the equipment. It can be a $10,000 custom extravaganza, or as simple as “3 rocks and a fire” with a pan on top. As an example of what can be done with “not much money”, this Altar is made from 8 common bricks that cost under $0.50 each, so a total of $4. There is a cast iron griddle on top of it that I bought some decades back for about $10, but any grate or pan would do. I have seen replacement grates for commercial grills sold for just a few dollars, and often the “pan” rusts out leaving the grill portion without a home, so the cost could be a low as “free”. So even a humble $14 Altar can be reasonably classy. The bottom is made of 6 bricks, laid in 2 rows of 3, side by side. Then two additional brick make the support for the metal surface. 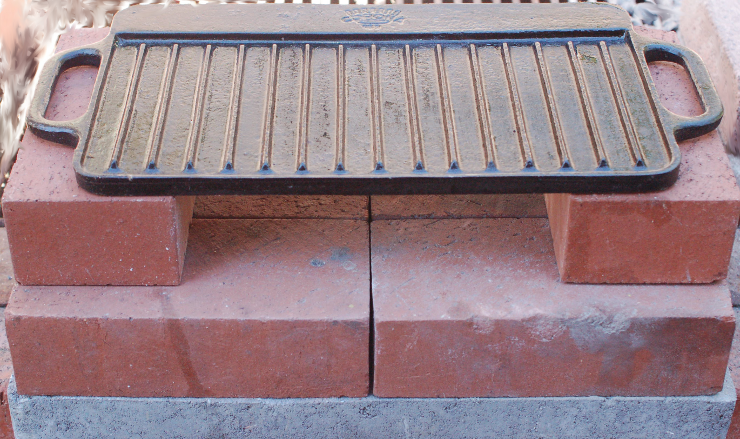 If a wire grill is used, it is best to put 2 more bricks on top of the ends to secure it against sliding. This cast iron griddle is heavy enough to hold itself in place. Once a suitable Altar is constructed, purchased, or identified ( or an expedient Altar found such as in a campgrounds or even an electric burner in a ‘residence hotel’ when traveling) it ought to be consecrated with appropriate sayings. “Blessed be this Altar”, “God Bless this Charcoal and all who use it”, “Good God and hot coals!”, or even “Nice.” (which is especially useful when others have set up an appropriate Altar, but are not members, and you wish to sanctify the Altar without too much attention being drawn). Personally, I prefer “Bless this Altar and Bless this Carbon.” but the exact words are not important. It is the sense of the central role of Sacred Carbon in life that makes an Altar consecrated. The consecration, like the Altar, can be as ornate, or as simple, as you feel it ought to be. As noted in the introductory page, it is preferred to use Carbon from natural woods. 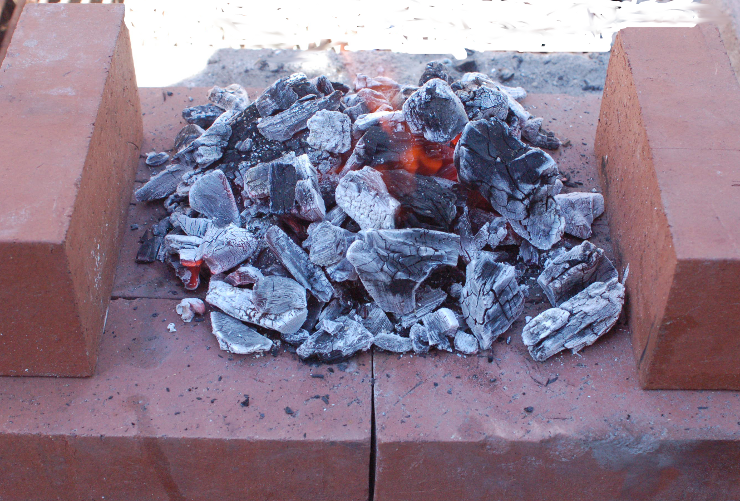 If those are unavailable or circumstances do not permit, it is just as acceptable to use “charcoal briquettes”, natural gas, propane, even gasoline stoves or kerosene stoves. Electric heat is discouraged, but acceptable if the only option available (as the “Grid” is full of fungible electricity, at least some of which was made with Sacred Carbon). But this is an example of the preferred way. In this case Mesquite is being used. It is particularly popular and common in the U.S.A. West. Member P.G. Sharrow prefers Manzanita, and having tried some he graciously gave to me, I must agree. However, not wanting to waste my bag of Mesquite, it is being used here. Yes, an overly generous amount here, but I wanted a nice picture, and for several offerings in a row, being generous is a virtue. I was also trying out both the griddle, and a wire grill. It is traditional to have several wave offerings. As many as your means allow and your heart desires. These frequently are made at any time from before, to during, and after the Burnt Offering. As few as one for some folks and at some times, or more as deemed appropriate. The Wave Offering is lifted and appropriate words said. This can vary with the circumstances. From a hearty “To Sacred Carbon!” at a meeting of like souls, to a discrete “To Life.” (which is really the same thing) in less tolerant environments. It is also allowed to simply have a moment of silence and think the incantation to yourself. In an ornate ceremony, the Wave Offering is held aloft, in the direction of the rising and setting sun, and longer offering prayers or incantations can be said. (But as this discussion is of a more ‘minimal’ example, “To Carbon! To Life!” is more in keeping). 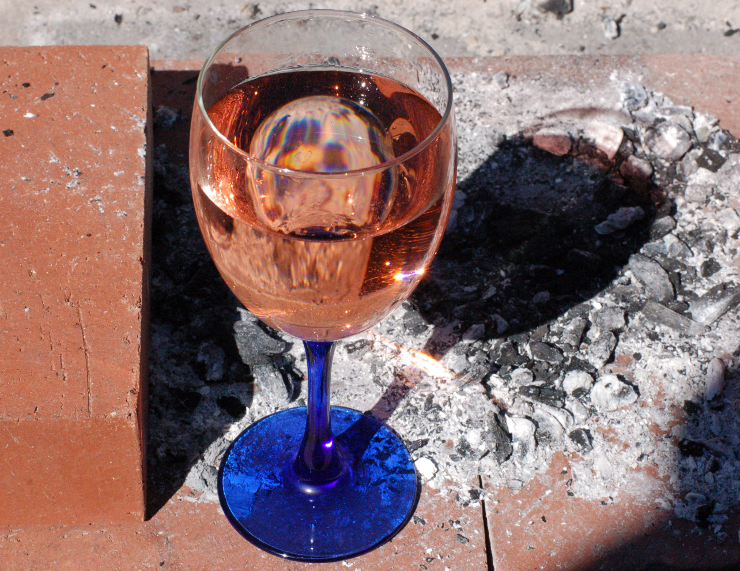 Here is a picture of a reasonable presentation of a Wave Offering (after the Burnt Offering was completed – witness the ashes behind the vessel). While normally it would be held aloft, I have set it on the Altar so as to work the camera. 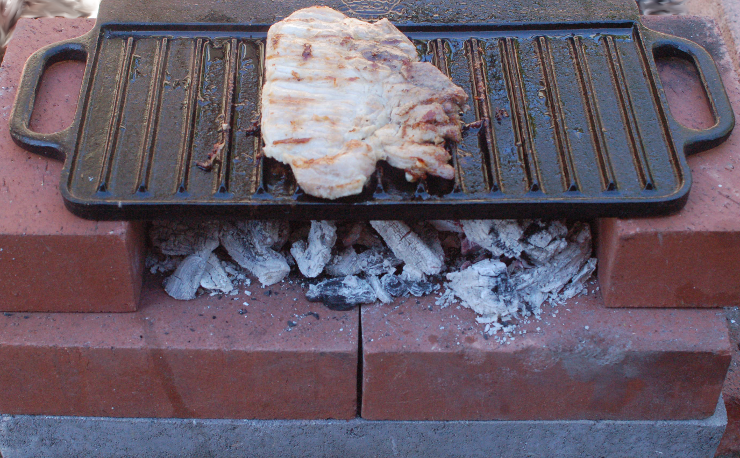 Some will notice that this is an offering of pork. I did that deliberately. While some traditions hold that pork is not to be eaten, that it is not Halal or Kosher, those traditions are based on the Biblical recognition of the known health risks of Trichinosis. Since the meaning of Kosher is to be healthful, and since modern methods let us assure the pork is, in fact, healthful, we have no prohibition on pork. (Those who wish to hold to the letter of the Bible or Koran are welcome to do so. Personally, I prefer lamb as a Burnt Offering.) So those of you who like things such as ‘pulled pork’ can prepare it as a Burnt Offering secure in knowing it is acceptable. Just be sure that any pork products are thoroughly Burnt and no raw red remains. For those who are vegetarians, similar Burnt Offerings can be made from, for example, metal skewers with alternating bits of onions, peppers, carrots, and mushrooms. Lightly coated with Olive Oil helps to enhance the character. In a future posting, I’ll provide a specific example of preparation. The Burnt Offering and the Wave Offering are then to be consumed by the faithful and brought back to life through your own life force, while nourishing your life force in the process. The Great Cycle Of Carbon, taking another turn. From life, to non-life, and back to life again. We all participate in this, a true miracle. We all can create new life from death, a resurrection of Sacred Carbon from death, back to life. In each of us is a Miracle. Just as the Sacred Altar releases dead Carbon to the air, returning it to life in trees, grasses, and plants world wide is, in its own right, a Miracle of the Great Cycle Of Carbon. Returning life to the dead Carbon, and returning Carbon to new life in plants all over the world. This can bring great peace, a feeling of centeredness, along with joy in living; being part of the circle of life, through Carbon. Given that, there is no limit on how often the service may be performed. At a minimum, once per week is recommended; but the very faithful may find that 2 or even 3 times a day brings greater fulfillment. It is entirely up to you how often you hold a service. How much reaffirmation of life through Carbon is desired. In all cases, it is a Holy Rite and a duty we all ought to perform to the best of our ability and means. This entry was posted in Uncategorized and tagged Atar, Offering, Ritual. Bookmark the permalink. Not sure about the Koran, but the Bible has both pork and fowl as ‘unclean’- along with the shellfish and assorted sea life. The pork/fowl rule to cooking nowadays is “always cook/burn until the juices run clear”- which kills the Trichinosis and Salmonella bugs. Will there be a standard length pendulum? Most bricks are 8 inches long (360÷8=45). Any cardinal point of direction should the altar be facing? Disposal directions/blessings for the ashes? Ah, so this was the reason for the string of stove and cooking posts in “the other place” (© UK Parliament). It has to be said, though, that when you have to contend with the British weather, the opportunity for a traditional service like the above is very fleeting, and limited to a few days in high summer. Fortunately, I have the Blessed Element delivered to my home through pipes, in a rather convenient gaseous formulation, which allows celebrants to watch the rain falling from the more comfortable side of the window (and thereby makes it a lot easier to feel celebratory). So far, no standard length pendulum needed. The Koran does not list forbidden foods so much as that it says the Torah (by reference not by name) is to be followed; and the Hadith tends to give the specifics. FWIW, I generally try to stay close to kosher (other than a weakness for pork some times). The “rules” are actually pretty darned good at weeding out the animals most likely to be a source of human illnesses. Including odd ones like Teluremia and Mad Cow. An Altar can face in any direction. Site requirements dominate desires. Personally, I like it to face the North Star (or Southern Pole down under), but it’s personal preference. The ashes have had their essence set free and are now just ashes. No longer special as the carbon has left them. I spread mine on the garden for use in making more life and more carbon in life. What a difference a continent makes… Yes, in “inclement places”, an indoor altar is preferred. Or one under roof, at least. Here, in Quaky-Shaky land, use of brick in construction is modestly rare. When used, it is often made more robust with various things like rebar and even fibreglass overlay. Some older homes have brick fireplaces and chimneys (but no new fireplaces are allowed where I am…) and much of what looks like brick is a faux brick facing.